There is something about wearing a t-shirt and jeans. Its comforting, easy to wear and takes no thinking. In a rush in the morning? T and jeans. And while anyone can pull it off, and its hard to go wrong with it, the look is uninspired. Its also my standby. To be honest, im usually wearing solid color v-necks. Nothing fancy. And while i do have a weakness for the occasional graphic t, my t-shirt drawers (yes, there are two) is mostly sold tees and a lot of shirts that i got from various groups and events I participated in. So today I’m making it my mission to keep my comfy, simple t-shirt and jeans style while still making it look like I put a little effort in it. Okay this isn’t a jacket. its a button up thats gotten a little tight in *ahem* certain areas. 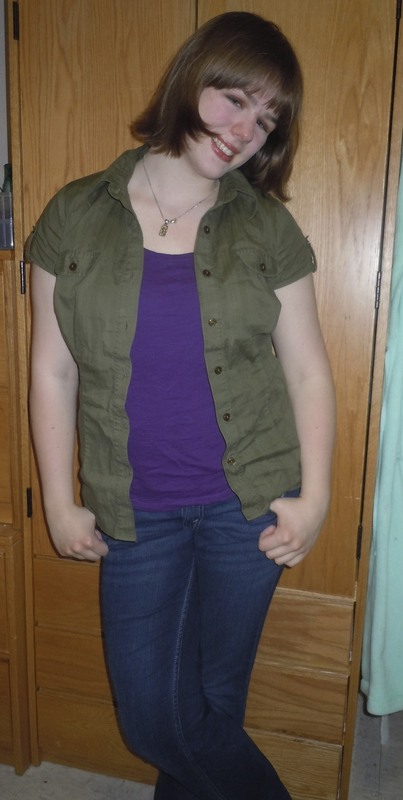 So i took one of my solid shirts and just throw the buttoned shirt on over. Another variation is using sweaters. You can get pretty creative with color combos, or just stick with neutrals in either layer. There are two ways to use the belt. One is using it just with the shirt to make a high waistline- key is having a shirt that lets you make this waistline, not always easy. The other is to wear a sweater (or in this case a flowy vest) and belt it. A good elastic belt is a great choice. Get something in neutral colors so you have flexibility in using it. You can wear a tee, just change it up by pairing a t-shirt with a good skirt. Suddenly a t-shirt doesnt look like a t-shirt anymore, its a dressy date-night outfit. Because I have a lot of solids, this black and white print skirt was a good choice. I can pair it with about any color, so I can wear my tee and have color and fun patterns too! 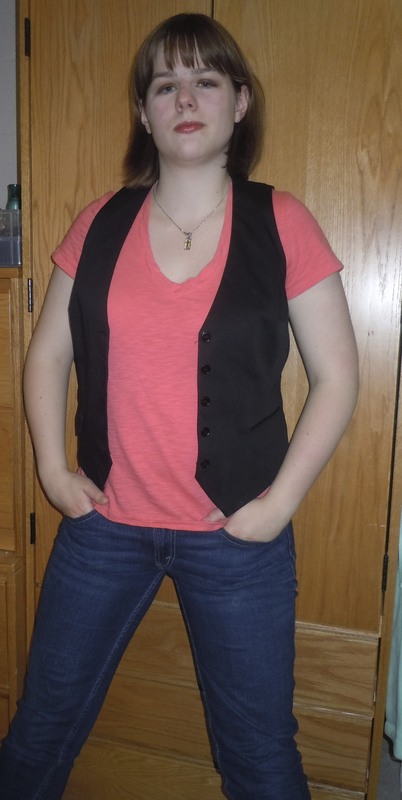 I love the look of a vest over a t-shirt in order to make it look a little bit more dressy. It adds a bit of formalness to an otherwise dressed-down outfit. Its a simple solution, add a scarf to the standard. 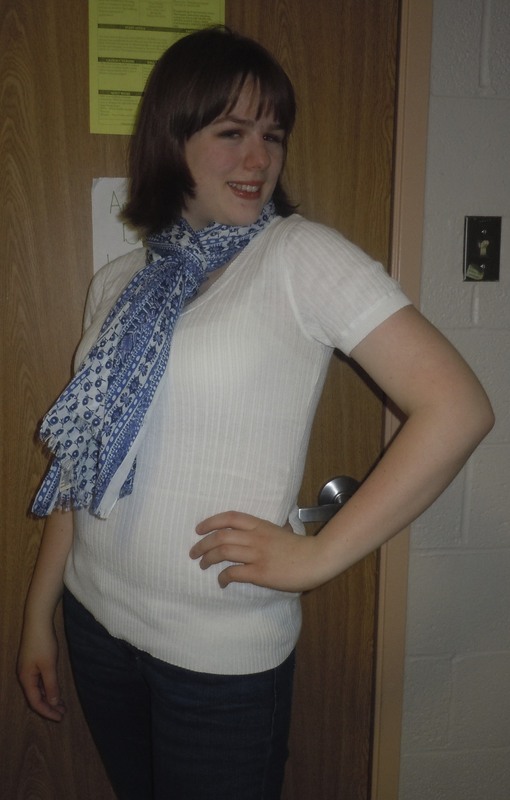 Tie it around your neck, wrap it around your head, even use the scarf as a belt. Scarves are a flexible accessory. Got a low cut v-neck or scoop neck, just but a cami underneath for a little extra sparkle or a lacy, feminine touch. So pick one, combine a few… be flexible! Send me your pics and ideas! What is your “fashion standard” and how do you keep it fun and fresh? One special question I have for you: What to you do to make your event t-shirts (usually unisex t’s) fashionable? Still working on that one… teach me! Keep me posted @aebrighter on twitter or leave a comment below! I look forward to hearing from you. Special thanks to Marrett Laney for helping with photography.